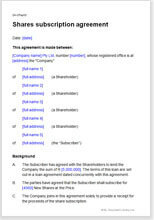 Share subscription agreement for new shares. Full buyer protection. To create majority or minority shareholding. Any industry. Full version, options for extensive warranties by other shareholders. Retention against poor performance. Other versions available. This is a comprehensive agreement for a new shareholder - an individual or another company - to subscribe for new shares in a private limited company. The company may be in any industry and of any size. The document assumes the subscriber pays in cash but holds back an agreed sum until after the next set of accounts. If the accounting profit is not as promised, then the final balancing payment is reduced. This agreement provides the same protection to the subscriber as you would expect if the whole company were being bought outright. You have the benefit of 131 warranties (less what you decide to edit out). The penalty reduction of balance due by you is calculated by reference to a simple, flexible formula. The subscriber may also make a loan to the company, though this is covered in a separate document and merely referenced in this agreement. Simply put, a warranty is a promise that something is as it is described, and which, if untrue, can allow the side relying on that information to seek compensation. This document differs from many other share subscription agreement templates in the number of warranties included. Warranties are important for two reasons. The first is that they protect the new subscriber, who does not have the same information as the directors and other shareholders about the state (and value) of the company. The second is that they can improve the subscriber’s position. Because it is normal practice for subscribers to demand warranties, shareholders often give them without being sure about whether the situation is as warranted. New subscribers can take advantage by asking for more warranties than they might need, and later seeking compensation for those that turn out to be false. We provide a very full set of warranties, in plain English so it is easy to choose whether you want each to be given or not. Existing shareholders will, obviously, want to limit the warranties given. This agreement is for a sale where new shares are issued - the buyer does not purchase the shares owned by someone else. If there is no new issue and the buyer purchases the shares of an existing shareholder, a Share sale and purchase agreement is more suitable. We also sell a simple share subscription agreement for uncomplicated transactions that don’t require the warranties that the other documents have.